No, they’re not telepathic and they don’t feel each other’s pain. But, twin brothers Joseph and Mario Guerrero have the ideal roommate, greatest support system, and easiest video game partner: each other. Mario, who studies mechanical engineering, and Joseph, a computer science major, became interested in science and technology at a young age, making numerous trips to the library and spending hours on the computer. Participation in the Museum of Flight’s Washington Aerospace Scholars program in high school inspired them to pursue science and technology in college. “Visiting companies and talking to people who are part of the aerospace industry made it seem less like a fantasy and more of an attainable goal,” said Mario. The Guerrero Brothers supporting the Amateur Radio Club at the Voiland College Ice Cream Social. Even though they’re twin brothers, the rigorous program taught them valuable lessons in team work. “If you’ve never experienced that level of collaboration, you just assume that your future in science will be like your high school classes—where you’re by yourself and relying on yourself,” said Mario. “Seeing what motivated, young minds can do together in only a week’s time was inspiring,” added Joseph. The brothers, originally from Snohomish, Washington, attended the University of Portland and briefly the University of Washington before transferring to WSU. WSU offered more of a community-based feeling and big-time resources, Mario said. 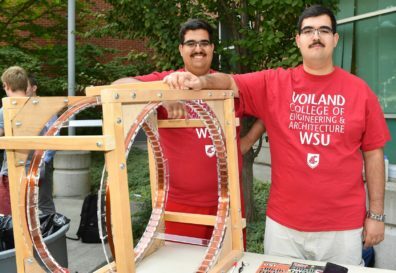 Since arriving at WSU, the brothers have used their skills as members of WSU’s Cougs in Space and Amateur Radio clubs. Cougs in Space is a NASA-funded student project to build a small satellite, set to launch into space in 2019. Joseph is president of the radio club and is helping with the communications system for the Cougs in Space satellite. Mario is the leader of Cougs in Space’s thermal team, working on modeling the space environment for the satellite. Through this experience, the brothers are getting hands-on learning while they get the chance to make valuable industry connections – which are helping them grow and develop into professionals. The twins explain that Cougs in Space emulates a business in a club structure, helping with fundamental relationships as well. “College club experiences are able to help with the future and are a lot more real than what you see in a college brochure,” said Mario. Gain real-world experience! Learn more about the variety of Student Clubs and Professional Societies that the Voiland College of Engineering and Architecture has to offer.